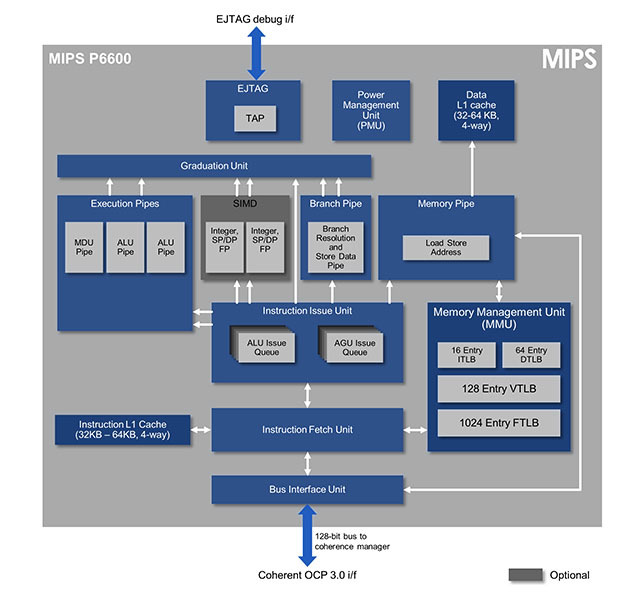 The MIPS P6600 is a 64-bit processor core that represents an evolution of the MIPS P-class family. Building on the 32-bit P5600 CPU, and paving the way to future generations of high performance 64-bit MIPS processors, the P6600 is the most efficient mainstream high-performance CPU choice, enabling powerful multicore 64-bit SoCs with optimal area efficiency for applications in segments including home entertainment, networking, automotive, embedded high-performance compute and more. 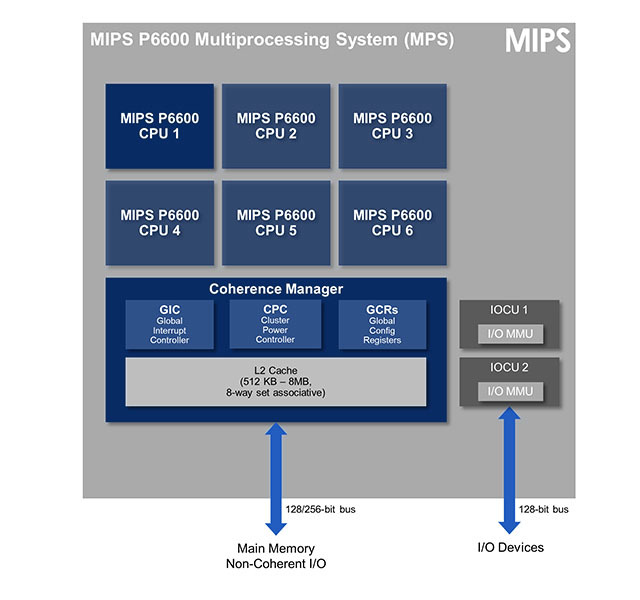 The MIPS P6600 CPU is based on a wide issue, deeply out-of-order (OoO) implementation utilizing the latest release 6 of the MIPS64 architecture, supporting up to six cores in a single cluster with high performance cache coherency. Complementing this raw horsepower, the core includes 128-bit integer and floating point SIMD processing, hardware virtualization, and larger physical and virtual addressing space coming from the MIPS64 architecture. The P6600 processor delivers performance in a smaller silicon footprint than leading IP core alternatives. SoC designers can use this efficiency advantage for cost savings, or to implement additional cores to deliver a performance advantage against competing silicon. Notes: Frequencies indicated range from 12T SVt area-optimized in worst case silicon corner, to 12T MVt speed-optimized typical corner silicon. Final production RTL results may vary.